En fait, cette solution est un retour à une fonctionnalité qui existait il y a 10 ans sur les switchs. Elle présente l’avantage de proposer un temps de traversée identique quelque soit la taille de la trame à l’inverse de la commutation “Store & Forward” qui doit stocker la trame en totalité avant de la rediriger. Cette ancienne solution est mise au gout du jour en intégrant la gestion de la qualité de service (802.1Q / 802.1p)et donc des VLANs. L’inconvénient majeur de cette solution est de ne proposer qu’une solution mono-débit de bout en bout (ici du 100Mb/s) car il est impossible avec cette solution de passer à un débit moindre (10Mbit/s) ou plus important (gigabit). Or le temps de latence du switch “store & forward” annoncé comme problématique en 100Mb/s (ici de 120µs) est divisé par 10 en gigabit minimisant ainsi l’impact du transport sur le réseau automatisme et garantissant l’interopérabilité entre switchs de différents constructeurs respectant le standard. Par ailleurs, en intégrant le standard IEEE1588, le PTP : Precision Time Protocol, le temps de parcours de tout le réseau peut être mesuré précisément de bout en bout et permettre ainsi de déterminer les critères Temps Réel du réseau traversé. Neither will guarantee determinism, however, making both insufficient for many automation applications. Protocol prioritization for IEEE 802.1q also is ineffective because automation protocols compete with other protocols of the same and higher priority. The delays that can result are unacceptable for automation. – Delays in the input port: If an input port’s queue (memory) is saturated with traffic from other protocols of the same or higher priority than the automation protocols, then the automation messages are delayed. (See figure 2.) This leads to unpredictable delays for automation protocols. – Bottleneck in the output port: If the switch’s output port is saturated with messages, high priority automation protocols also have to wait for port release. (See figure 3.) A low priority message with a length of 1,500 bytes leaves the output port. The high priority automation message then has to wait up to 125 ?sec for port release. If traffic in the network is very low, then only the Ethernet transmission rate, the message length, and switch latency periods determine the message transition delay. In this example, the minimum message transition delays are approximately 160 ?sec. An increase in Ethernet network load results in delays in the input ports and also creates bottlenecks in switch output ports. If a very long message leaves an output port on the above route and if a high-priority automation message leaves the switch on the same port, then the automation message has to wait for release of the port. This effect can be repeated on the route and culminate in several milliseconds of delay. In a line, this can occur at one switch as both messages travel the same route. The automation message always follows the long message and, each time, would have to wait until after the long message leaves the ports. There is no passing lane. Probability of this undesired effect grows with network load. With just 16 switches, message transition delays of several milliseconds occur. Harting Fast Track Switching resolves this problem. The Fast Track Switch detects automation protocols and passes them on with priority over all other protocols. 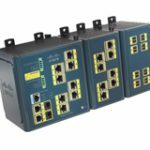 In this way, it gives automation priority over other Ethernet applications. The Fast Track Switch accelerates all detected automation messages using the integrated cut-through method and prevents delays.